I can keep quiet no longer! Well, more accurately, I can actually talk about this now in some confidence. Barring the accidental release of attack cyber-chickens from the secret laboratory they are being developed somewhere in Devon, Dark Harvest: The Legacy of Frankenstein the RPG has a new home. Angus Abranson brought DH:LoF to Cubicle 7, and now he has offered it a new home at Chronicle City. The current plan is to have a 2nd Edition of the RPG by this time next year, and work has already begun on it. Many thanks, as ever, for all your support and patience. I’m very excited to be able to move forward again after having been in a holding pattern for the past year. Many thanks to everyone at Cubicle 7 for all of their help and support in getting DH:LoF off the ground. Huge respect and thanks to Angus for his passion, support and expertise – past, present, and future. The official announcement has now been made on Chronicle City’s website. Thanks to the help of Scott and Matt at RPG.net, we have another bit of news for you. As of now, the PDF version of the 1st edition core book for Dark Harvest: The Legacy of Frankenstein is available to download for free. This is not a limited time thing. It is available now for you. Now. This very second. Resistance and Tales of Promethea will remain at their normal prices. Tales of Promethea can also be found on Amazon.com and Amazon.co.uk. 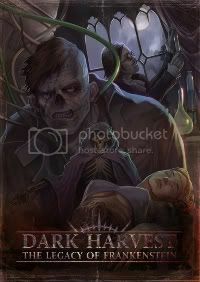 The keen-eyed (and slightly obsessive) amongst you may have noted that, over on DriveThru RPG, Dark Harvest: The Legacy of Frankenstein is no longer listed as part of the Cubicle 7 stable of games. This is indeed a thing. Cubicle 7 have been a massive part of the early success of Promethea. All of us involved with DH:LoF will always be grateful for the support that Dom, John, and everyone there gave us, and indeed continue to do so. C7 needs to concentrate on its own games, and rightly so, so is winding down the print partnership arrangements. We have been released into the wild, and on to new opportunities. This is a terribly exciting time! There’s so much I’d like to talk about, but can’t yet. I’ve another two announcements to make in the next little while, so do watch this space. Also, keep an eye on the Frankenstein’s Bodies Facebook page, as there are Big Things afoot there in the coming months. In the meantime, my thanks to Scott Holden and Matt McElroy over at DriveThru for making the transition such an easy one from their side. Top blokes!! The gorgeous folks over at Haunted Eyeball have reviewed Tales of Promethea. Do pop over and have a look. Over on Eric Franklin’s site Talking Game, there’s a chance to meet a new character to perhaps introduce to your own campaign. Eric’s wife, Stephanie, is a huge fan of all things Frankenstein. This drew her to DH:LoF, and to writing one of her semi regular Character Generation Project entries. The results are on the blog for all to see and to borrow. We’re hoping to convince Stephanie to write more of her thoughts on Promethea but, in the meantime, do visit Talking Game and have a poke around. The interviews that various contributors to Tales of Promethea were kind enough to do a little while before Christmas of last year are now available on this site. You’ll find a bunch more goodies have been added to the Interviews section of the site. We’ve included an exclusive excerpt from the ToP work of the writers who were interviewed; that’s Matt Gibbs, Kate Harrad, and Stuart Boon. In the interview with Jan Pospisil, you’ll see the initial sketch and finished image for the cover. In the Dark Texts section of the site, you’ll find a download of one of the stories from the anthology – Way Out. That’s right; a complete tale from the book in PDF form. Over on the games site Life and Times of a Philippine Gamer, Jay has said nice things about Tales of Promethea. Go for the review, stay for the rest of the site. Tales of Promethea – Interview Time! Update! The interviews with editor and story contributor Matt Gibbs and cover artist Jan Pospíšil have also been posted. You can read those here.